Home > Free Utilities > How to Backup Android Data without Root? Android is one of the most popular mobile computing platforms. The smartphones loaded with Android platform are generally considered to be safe. However, there could be situations where your Android phone fails to work properly. There are cases where the smartphones loaded with Android automatically becomes unusable due to hardware failure. Hence, you should make use of the exclusive apps using which you can backup android without root. 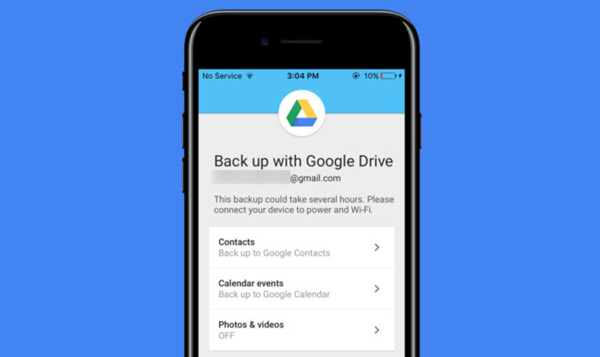 In this article, we will examine the list of 10 best android backup apps using which you can save files such as images and videos without rooting the device. With Google Drive, you can store plenty of files using not only smartphone but also tablet and computer. 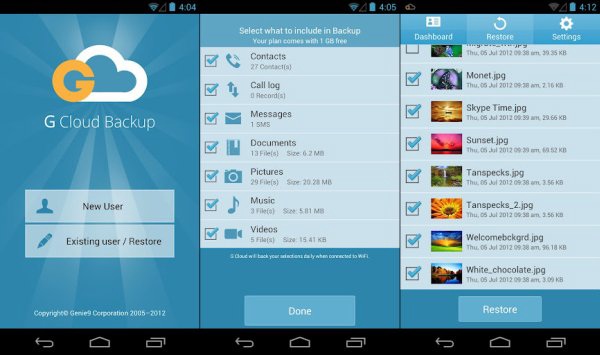 You can back up images, videos and documents from your Android smartphone without rooting. You can also invite others to view, edit and leave comments. It is also possible to share the link with others. Safe storage for all files on the go. Ability to search for files by name. Ability to share files with other people. Ability to scan in paper documents via device camera. Navigate content from Google Photos. 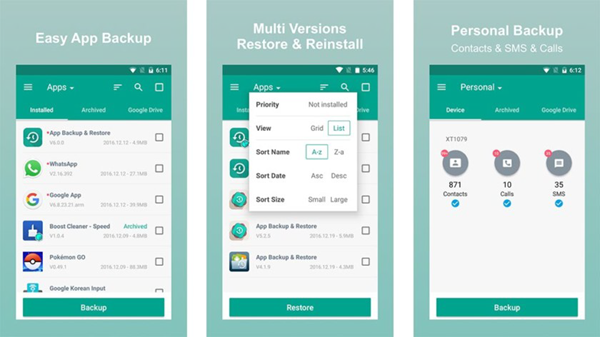 The App Backup & Restore app helps you to back up your apps to RAM, memory card or cloud storage. You will be able to free up internal storage of the device using the app. The app also comes with exclusive APK backup and restore modules using which you can extract, edit, install and share APK files. You can backup and restore apps that re not used frequently. This will save valuable space on your device. It is also possible to schedule backup and restore operations automatically including the ability to batch backup and restore for enhanced data protection and security. You can also create your own appstore locally to transfer and share apps. Backup apps to RAM, Micro SD and Cloud storage. Extract APK files and export as duplicates. Restore apps after a factory reset. Automatically refresh your app list. Migration of apps to several devices. 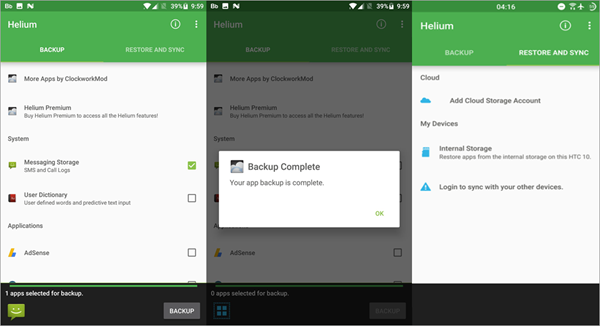 Helium is a backup software for Android and it doesn’t require root. The app helps you to back up your apps and data directly either to your SD card or cloud storage. It is possible to sync app data from other Android gadgets including the ability to setup backup schedules. You should install Helium on both Android and computer. The next step is to establish connectivity between your device and computer. The USB connection mode should be changed to PTP. Backup & Restore to SD card and PC. Backup to Dropbox, Google Drive, Box, Mega and others. 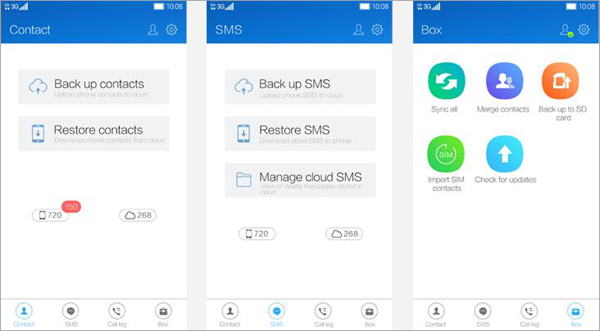 SYNCit automatically backup and restore all the contacts, SMS messages and call logs. You can also maintain a permanent cloud backup of all your contacts including call logs. It is possible to quickly restore the data on a new device. Instant backup with a single touch. The G Cloud Backup provides a facility to backup contacts, images, videos, messages, music, call logs including documents to the cloud. It is possible to migrate data to several devices in addition to management of memories in a timeline. You can view the first recorded video and a call you made nearly two years back. Automated backup of messages, SMS and much more. Navigate messages, call logs, images, videos from the web•. App protection via a passcode. Secured data storage via Amazon AWS. Ability to upload via 3G. Dropbox is the most reliable tool for backup and restoration of files. You can work with Dropbox either from your computer or mobile device by installing the app. The Dropbox app automatically sync data between several devices and you can access them at any time. 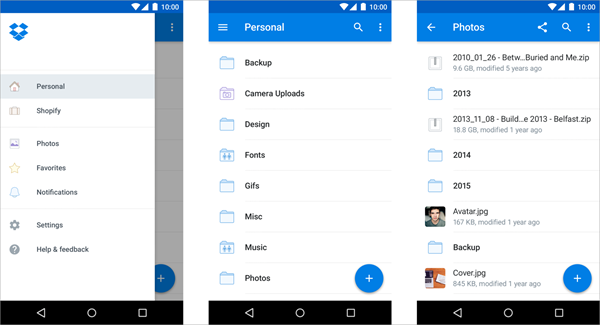 You can deliver large files even to those people who don’t have an active Dropbox account. The tool provides shared folders, offline access including doc scanner. You can register for a 30-day trial of Dropbox Plus, which provides 2TB storage. Document scanner for PDF generation. Share and Edit Word, Excel and PowerPoint files. 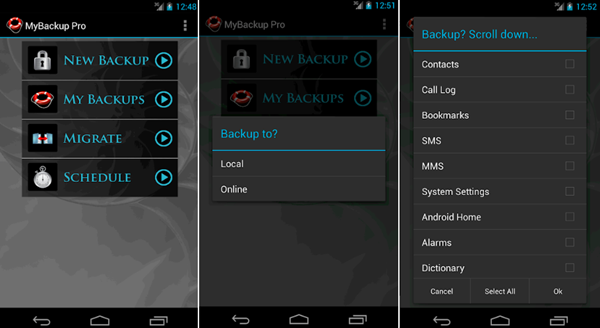 My Backup helps you to backup data to your smartphone or SD card. Moreover, you can also backup and restore with the help of an OTG USB card. It is possible to schedule automated backups multiple times. If you have root access, you can backup APKs and data. The app works on all Android devices irrespective of root access. 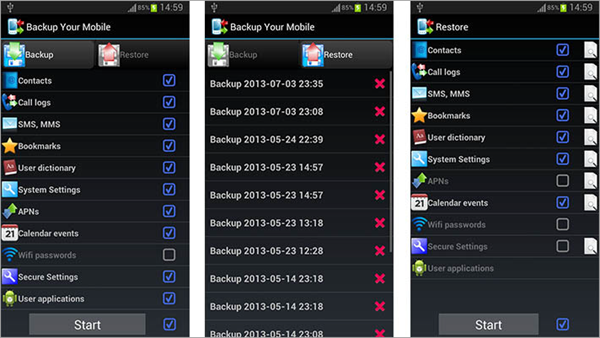 Backup and Restore to any Android device. Ability to backup via Rerware Cloud, Google Drive and Dropbox. Wipe cache and data of applications. The Super Backup & Restore enables you to backup applications, contacts, SMS messages, call history including bookmarks to your memory card or Gmail. You can also copy to cloud including the capability to share installation files to others. However, you can perform backup and restore apps data but it requires rooting. It is also possible to batch restore apps from SD card. Ability to backup apps to SD card. Ability to backup App link for installed apps. Deletion of backup data on D card. Automated upload of files to Google Drive. Ability to display last backup parameters. Ability to modify backup folder path in Settings. 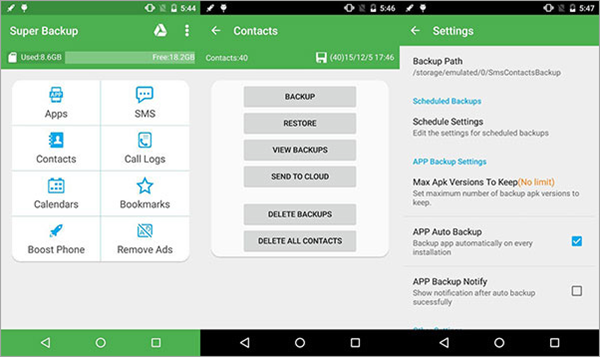 The Backup Your Mobile app provides an ability to backup and restore contacts, SMS messages, call logs, system settings including user dictionary, bookmarks and browser history. You can store backups on SD card, RAM or cloud services such as Dropbox, Google Drive, Mega and OneDrive. You can initiate automated backup scheduling. The app can also copy data from one device to another easily. You should note that Access Point Name (APN) doesn’t work because Google has modified the security policy. You can enable few workarounds for those devices that are rooted. Ability to backup and restore SMS, MMS, call log, bookmark and browser history. Capability to work with Calendar events. Management of Secured system settings. 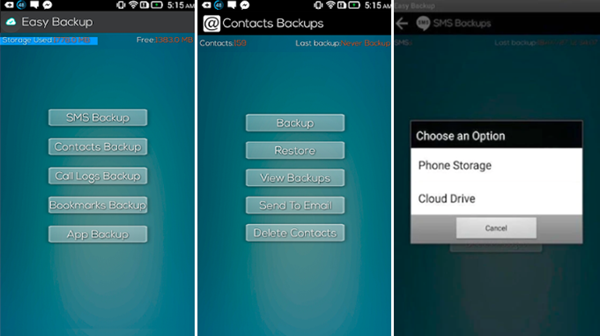 If you would like to backup and restore contacts in a bid to backup android everything, you can make use of Simpler Backup app. It is possible to backup all your contacts with a single touch. You can send a .VCF attachment via email including the ability to easily restore contacts. Ability to backup contacts easily. Ability to export backups to cloud storage quickly. Swap contacts between different accounts. Even though your Android device is safe, it is essential to capture backup of important files such as images, videos, contacts, SMS messages. This will help you to easily recover lost data in case of damage or theft. 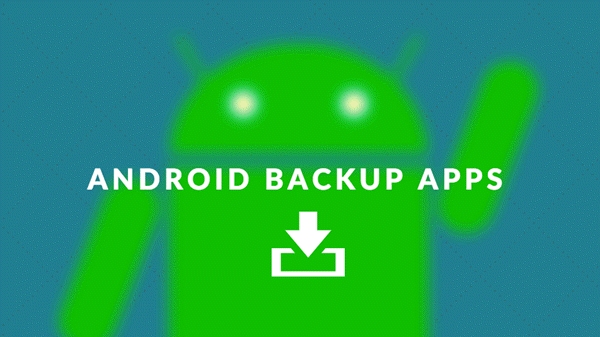 We hope you have learned about the best android backup app without root in this article.